We are a family run Hog Roast Caterers and Hog Roast Wedding Caterers local to Hull - proud of the quality of our food and the numerous catering awards we've received. All our hog roasts are Howden bred Free Range hogs that have won the prestigious "Good Pig Award 2012". Our hog roasts are chosen and bred for quality and taste. Slow roasted pulled pork so tender it falls from the bone, delicious. 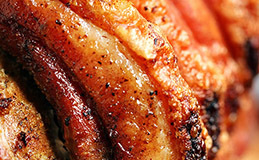 The wonderful crackling enhances the flavour of the succulent lean meat. Our hog roasts in Hull are perfect for any special occasion, wedding or event. It's the best hog roast you will ever taste! 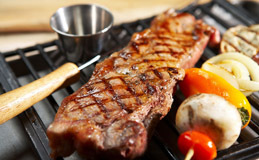 Our barbecue caterers provide a perfect service for any occasion, wedding or event. We use free range pigs bred near Hull to produce quality sausage range and only 100% outdoor reared beef for all our handmade burgers. This really is scrumptious BBQ catering at its best. With lots of menus that can be adapted to suit your individual needs we are sure to have one that suits your occasion. Big Pan Catering is becoming increasingly popular. 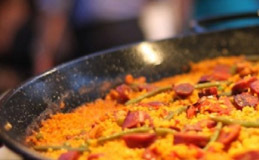 Choose from our authentic Spanish Paellas or traditional Mexican Chilli to our Moroccan Lamb and more. Your guests get to see the menu made right in front of their eyes. They absorb all the sizzling sights and smells of the ingredients coming together in one big pan before being served straight from the pan to the plate. Speak to our wedding caterers about your big day and feel free to change our menus around. Create your own that's perfect for you on your special day. Discuss your requirements with us and blend our menus together to create something bespoke and special for any bride and grooms individual requirements. High quality wedding catering service in Hull perfect for the wedding reception and the evening celebration. Happy Hog Roasts Hull supplies local succulent free range pulled pork hog roasts and barbecues to Hull and all surrounding areas. A hog roast barbeque has now become a great British tradition. Our Hull Hog Roast Caterers are great no matter if it’s your wedding, a party or even a corporate event. Spit roasted Hog Roast catering doesn’t just feed your guests with a hog roast sandwich, it can add some theatre to the occasion. A hog roast always draws a cheerful crowd as guests gather to enjoy the sight and the aromas of meat cooking. The excitement of watching and waiting before the meat is ready to serve; tender pulled pork and crackling to die for. Our Hull hog roast and bbq team can help make your event a really enjoyable experience for some of the most important times and special occasions in our lives. We providing tasty free range special breed pigs from the Yorkshire area and create menus to suit all occasions. Our flaming BBQ delights together with formal and informal dining packages that are great value, help to make your wedding dreams come true. We will constantly work with your to meet your needs by adapting our menus to suit your requirements for your special occasion. 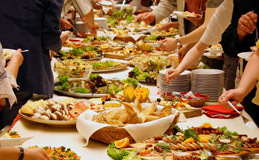 Hog roast catering in Hull has been steadily growing with ever more popularity over the years, and now more than ever people look for Hull outside Hog Roast caterers that offer a great service with fantastic value. For special occasions like weddings you need solid reliability, and at Happy Hogs and Hull Hog Roast Catering that’s something that we excel in. We love to promote the pig roast tradition and the ancient art of the Hog Roast as well as our other outside BBQ catering events. We offer fantastic local Hog Roasts Hull value, without cutting any corners. We are the consummate professionals in our field. Our staff are experienced full-time caterers. We use the latest generation of CE Approved Hog roasting machines, operate reliable vehicles and hang our local free range meat prior to dispatch in refrigerated storage. When you book with Happy Hogs and Hull Hog Roast Catering you can be sure you are getting the best hog roast catering service with the finest free range hog roasts available in the Hull area.